Who would have guessed that edible gardening would become a trend in the past few years? Perhaps it is more than a trend and growing your own food is here to stay. In any case, many people are starting vegetable gardens in their backyards, on balconies and patios and a few daredevils, in the front yard! Of course you can grow food in your front yard, but I believe it should be designed well so that the yard looks great year-round. This can be accomplished by adding structure to your landscape. We did this by creating a formal-style Knot garden filled with edible plants and herbs! I want to share this edible garden project in conjunction with a few other talented designers who are blogging on the subject of edible gardens for the Garden Designers Roundtable blog today. I have links to these other blog posts at the end of this article. Before- Such a waste of beautiful architecture! An English Tudor-style cottage has been taken over by dead plants, an overgrown bush and a really dead lawn! Grab a cup of tea and sit down to watch the Garden Police take this disgrace of a yard and change it into a traditional herb knot garden. You will "knot" believe the transformation! Homeowner Susan Yakley has a Tudor-style cottage in a charming neighborhood of architectural homes, but her eyesore of a yard is causing undue stress on the neighbors. The biggest dilemma is that there is no design to her yard, just a dead lawn and some oversized bushes that cover up her beautiful paned windows. There is also a "pseudo" retaining wall near the driveway that isn't holding anything back, including bad taste! The Garden Police cite her for neglecting her yard, causing a public nuisance, and failure to design an appropriate garden that makes better use of her space. Before- Hansel and Gretel would never live here! After- But they would be proud to live in this home and eat from the edible front yard garden! After- Once the pattern of the windows emerged, we added focus to them with this complimentary diamond back garden bench made from recycled plastic! After…Such as an edible front yard garden in the Tudor Knot garden style! In order to bring some style to this yard we had to put in our hard work and demand some "sweat equity" from Susan. We wanted to start with a clean palette so everything in this yard, dead or alive had to go- except one plant, an overgrown Hawthorne shrub. Michael and I decided to keep it and shape it into a small tree. The retaining wall near the house was demolished so that we could build a better planter using a "Celtik Wall" system that requires no mortar and is self-leveling. Thompson Building Materials provided it for us. The soil was rototilled and amended with new soil from Kellogg Garden Products in order to give the plants a rich and nutritious planting medium. We installed a new sprinkler system using a state-of-the-art Rain Bird drip spray system. Before- Shaping the knot garden requires digging and preparing the garden beds and digging deeper in other areas for the new gravel paths. After- Knot gardens are identified by patterned edging as seen here. We planted lavenders, thymes and other herbs. Before- The design is taken all the way to the curb. Why not use ALL of the front yard? Triangular beds are edged with pavers for a clean outline. After- The parkway knot garden is pattern perfect! We planted herbs for their ornamental value although they can be eaten, this is a popular walking route for the neighborhood dogs. Who wants to eat "pee pee" herbs? We removed the lower branches as well as crossing branches of the overgrown Hawthorne bush and fashioned a small tree. We also opened the canopy so that it looked light and airy. After grading the raised bed away from the house for better drainage, we enclosed the area with a Celtik Wall System by Belgard. The stacked pavers gave us the opportunity to plant inside the crevices. Rainbird's "Xeri-Spray drip spray system provides complete coverage of the edible garden while conserving water usage. One look at this Tudor-style cottage and Michael and I were swept away to England. Instead of putting in a water-thirsty lawn and some plants, we wanted to plan a garden that was theme- appropriate for the architecture. Susan expressed an interest in cooking and wanting to be an active gardener so we designed a "knot-garden" and filled it with herbs for her to tend. The Knot garden is an ornamental creation of shapes using short hedges, herb garden areas and pathways. Privacy was also an issue for Susan as her yard was open to the neighbors driveway and she looked on to parked cars. We installed a lightweight fence using redwood posts and wire to train espaliered apple trees along it. The apple trees will become a "living and giving fence" in a couple of years. Gravel paths and sitting area. Custom rebar garden arch made by Iron Knob Corporation in Northridge California (818. 830.7747) for the walkway. French Urn in "eggnog" color by Asian Ceramics, Inc. (model 5-2727-E) becomes our "salad bowl" with lettuces, chives and artichokes. Keep in mind that if you raise edible plants in containers, you are more likely to keep the plants from being urinated on by dogs. We edged our knot garden beds with "Holland" standard pavers by Belgard. It's so simple to keep an edible front yard looking neat with design structure like this. We used pea gravel for the walkway as it is a traditional flooring material in English and Knot gardens. Pea gravel is also inexpensive and comes in a variety of colors and sizes and is a wonderful permeable floor that allows water to drain through instead of running off into the street. A simple wood post fence supports the espaliered apple trees that will grow and form a living wall to separate Susan's yard from the neighbors. Espaliered fruit trees come in many different varieties and are ideal to use in small yards especially when integrated as walls. We used 4 x 4 redwood posts and copper wire tied to eyebolt screws to fashion the support fence for the espaliered apple trees. The "Chippendale" style bench in mahogany color is made from recycled plastic and won't warp, splinter or mildew. The design matches the window panes and provides a place to sit and enjoy the edible front yard up close. Made by the Polywood company. Michael and I designed a custom arch made from iron rebar to punctuate the front walkway. We needed to add a tall vertical element to the yard as most of the plants were lower profile. The edible front yard Knot garden is defined by its symmetry, repetition of plants and patterns. A nice detail is the containers used within the garden beds as focal points. The plants, hand selected at Green Thumb Nursery were chosen for their contribution to the garden through fragrance and culinary or medicinal use. Try them in your garden, we don't mind if you steal our ideas! Eugenia myrtifolia (three-tier topiary) White flowers, edible "cherries"
Leptospermum scoparium "Gaiety Girl" (small accent trees) Evergreen with flowers, early New Zealand settlers soaked leaves to make tea substitute. Lavandula stoechas "Quasti" Fragrant ,dark purple flowers, attracts butterflies. Lavandula multifida Fragrant, grey-green foliage, deep blue flowers. Dry for potpourri, flavor water. Salvia greggii "Lipstick" Aromatic folliage, attracts hummingbirds, use in cooking and sore throat gargle. Armeria maritima "Cottontail" white Profuse white blooms extends all year in mild climates. One of the benefits of espaliering fruit trees is that you can enjoy fresh fruit from your garden and you do not need a large yard. The space required is horizontal and you can grow against a sunny wall or create a "living fence" like we did. It takes a few years for the tree to take the shape, but you can buy instant espaliered trees at your nursery if you are impatient. If you are like me, most of the fun (besides eating the fruit) is nurturing and handcrafting the shape of your espaliered tree. To learn more about this ancient horticultural art please go to Aggie Horticulture or MotherEarthNews.com. This project was very exciting for me since herb and vegetable gardens are one of my specialties! The garden was filled with delicious scents- especially around the basil and rosemary beds…it made me crave pasta. You could see the growing excitement in Susan as soon as we brought out the plants. Her eyes opened wide and I could see her salivating from the thought of all the delicious food she was going to prepare with her fresh herbs. A gardening convert, Susan declared that gardening was her new hobby and that she couldn't wait to dig in and weed, stake, harvest, and share with others from her plot. With a reaction like this, I say "mission accomplished!" Get out in your yard and enjoy life to the fullest. Shirley Bovshow and Michael Glassman co-hosts and designers of the "Garden Police" show. Follow the links to see how this months line up of the Garden Designers Roundtable tackle the edible side of gardening. Amazing results! You are really good at designing beautiful gardens! I'm in love with the front yard! Keem doing your magic! You are great! 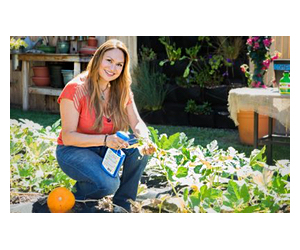 This vegetable garden makeover is really amazing! It will surely entice a lot of people to do the same since it is great to have an edible garden that promotes organic living. Thanks for sharing. oohh lovely makeover! once we have our new place i will make sure there’s gonna be a garden too! I’m super impressed! Love the before and after! Urban gardening and urban agriculture are ideas that are becoming increasingly important as our world becomes more urbanized and developers transform agriculturally fertile lands and open spaces into sprawling suburbs. Your creativity and attention to detail are unmatched. We really enjoy looking through these transformations. Keep up the awesome work! The transformation is really amazing. I loved how you guys transformed the overgrown bush into a small tree that helped accentuate the interesting window patterns. A knot-garden with herbs is just practical and the English look to the landscape to complement with the architecture is just superb. Great story. The make over is splendid! Thanks for visiting Eden Makers and for your kind comment! You made my day. This was one of my all-time favorite makeovers on your show as well. Love it. Thanks for the photos so I can re-visit this lovely garden again! Shirley this is a great project, thanks for sharing it with us. The emotion shown from the homeowner tells the whole story, doesn't it? You must have felt so proud after completing it. Shirley, this is stunning. Your attention to detail and the respect with which you treated the architecture is amazing. What beautiful photos and food for thought. Thank you Rebecca. I will share your compliment with Michael Glassman, we designed everything together. What a joy he was to work with! Thank you for your hearty compliment! I appreciate it Robert. Wot a great makeover story. Shirley, what an incredible transformation. I especially like the use of triangular lines to echo the Tudor architecture. Your before-and-after post brings home how much you accomplished in this redesign. Well done! Wonderful transformation, Shirley! And thank you especially for sharing the plant list. Thank you. I wish I had your book so I can add some heartfelt words about it. What i can say is that it must be FANTASTIC because I like the snippets I’ve already read on Gen’s blog! Glad you liked my garden and I wish you much success with your book! Shirley, I ADORE what you did with this garden – you brought the architecture of the home into play by reflecting it in the hardscape! SMARTY-PANTS!!! Good hardscape is essential when planting edibles in such an important location – the front yard is totally pride of place! What a fantastic, comprehensive, and USEFUL post – anybody can take your plant list and resources and do it tomorrow! RIGHT ON!! !